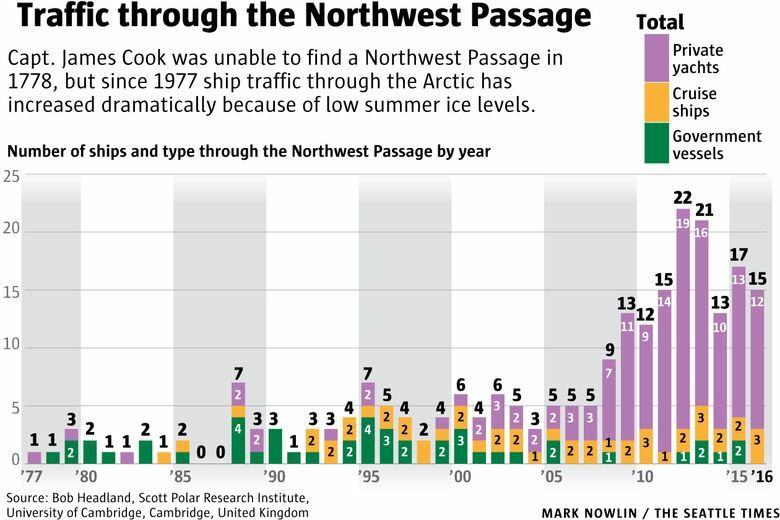 Records from Cook's voyage north reveal the extent of the Arctic ice pack and contrast with today’s ice-free summer route through the Northwest Passage. Passengers simmered in Jacuzzis and feasted on gourmet cuisine this summer as the 850-foot cruise ship Crystal Serenity motored through the Northwest Passage. But in the summer of 1778, when Capt. James Cook tried to find a Western entrance to the fabled route, his men toiled on frost-slicked decks and grumbled about having to supplement dwindling rations with walrus meat. The British expedition was halted north of the Bering Strait by “ice which was as compact as a Wall and seemed to be ten or twelve feet high at least,” according to the captain’s journal. Cook’s ships followed the ice edge all the way to Siberia in their futile search for an opening, sometimes guided through fog by the braying of the unpalatable creatures the crew called Sea Horses. More than two centuries later, scientists are mining meticulous records kept by Cook and his crew for a new perspective on the warming that has opened the Arctic in a way the 18th century explorer could never have imagined. Working with maps and logs from Cook’s voyage, along with other historical records and satellite imagery, University of Washington mathematician Harry Stern has tracked changes in ice cover in the Chukchi Sea, between Alaska and Russia, over nearly 240 years. The results, published this month in the journal Polar Geography, underscore the dramatic shrinkage of the summer ice cap and shed new light on the timing of the transformation. The analysis also extends the historic picture back nearly 75 years, building on previous work with ships’ records from the 1850s. “This old data helps us look at what conditions were like before we started global warming, and what the natural variability was,” said Jim Overland, a Seattle-based oceanographer for the National Oceanic and Atmospheric Administration who was not involved in Stern’s project. 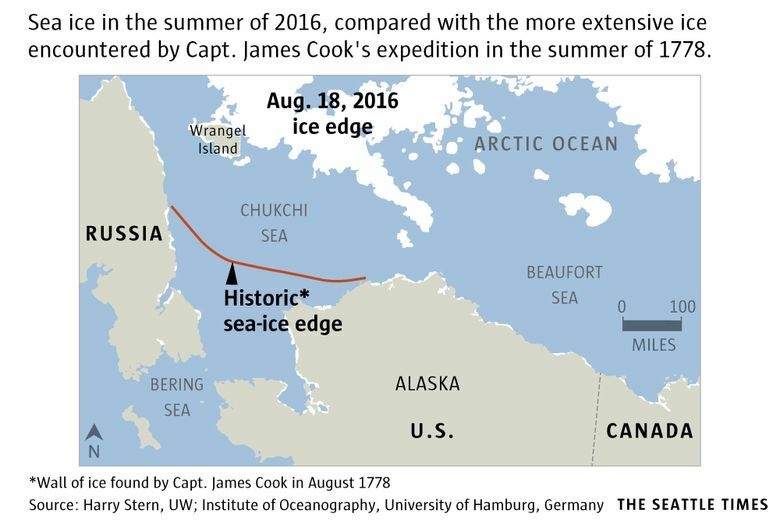 Though earlier explorers ventured into the frigid waters off Alaska, Cook was the first to map the ice edge, Stern said. The renowned explorer undertook the voyage, which also covered the Northwest coast, with secret orders from King George III to seek a shorter trading route between Europe and the Far East across the top of the world. Stymied by the ice, Cook eventually headed for the winter to Hawaii, where he was killed by the native people. 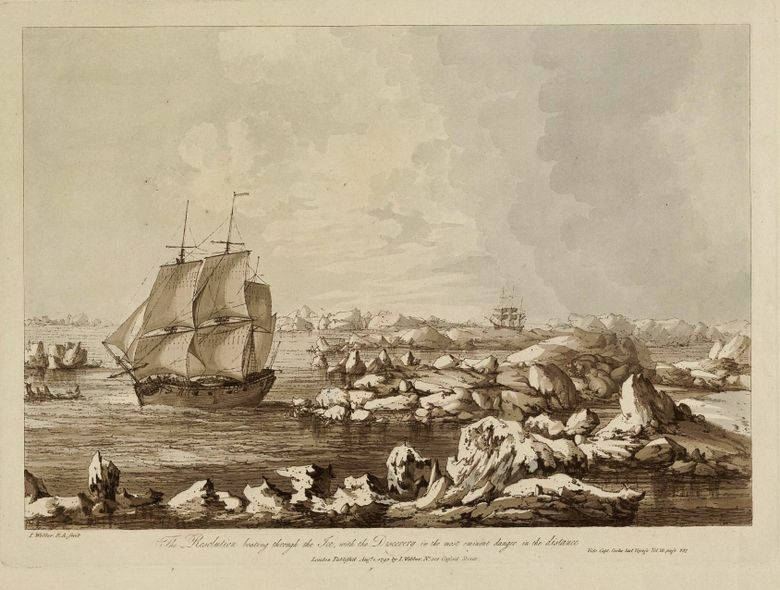 Stern’s analysis found that for more than 200 years after Cook’s visit the summer ice cover in the Chukchi Sea fluctuated — but generally extended south to the same vicinity where Cook encountered it. That meshes with modern observations that confirm rapid shrinkage of the Arctic ice pack over the past three decades, Overland said. The total volume of ice in summer is now 60 to 70 percent lower than it was in the 1980s, while Arctic temperatures have increased at twice the rate of the rest of the planet as a result of rising greenhouse-gas levels. “That’s probably the largest indicator that global warming is a real phenomenon,” Overland said. With more melting in the summer and delayed freezing in the fall, the once-elusive Northwest Passage is now navigable to private yachts and vessels like the Crystal Serenity, which made the 7,300-mile trip from Alaska to New York in 32 days. The transformation has also triggered a rush to drill for oil in previously ice-choked waters — and an international power struggle over control of the route and resources. The tensions are similar to those in Cook’s day, Stern pointed out. Nations then were eager to find and claim a Northwest Passage, while whalers and fur traders scrambled to exploit the newly opened frontier. Wood helps run a project called Old Weather, which relies on citizen scientists to transcribe and digitize old ship’s logs. Since the effort began five years ago, thousands of volunteers have processed 1 million handwritten pages from whalers, fishing vessels and U.S. revenue cutters. The data are being used to re-create past weather patterns and improve climate models. Historic ice measurements are especially valuable, Wood said, because existing models don’t seem to do a good job of forecasting ice cover. While models predict the Arctic won’t be ice-free in summer until 2050 or later, the current pace of change suggests it will happen much sooner. Cook’s ice observations are also of interest to historians. David Nicandri, former director of the Washington State Historical Society, is finishing a book in which he argues that Cook — who is usually associated with Hawaii and Tahiti — was actually the original polar scientist. Cook also explored southern polar waters, searching for a rumored continent. Though he never found Antarctica, the experience led Cook to question the conventional wisdom of the time that held that oceans couldn’t freeze and that sea ice originated in rivers. “Cook never fully got it right, but he realized there was too much ice to have flowed out of any set of rivers,” said Nicandri, who was also co-editor of a series of essays entitled “Arctic Ambitions: Captain Cook and the Northwest Passage” where some of Stern’s analysis was originally published. Cook also described different types of sea ice and suggested that thick walls and ridges, like those he saw in the Arctic, must represent multiple years of accumulation. “He’s never given credit for his pioneering work in polar climatology,” Nicandri said.